I promise to buy a new camera next week and the main reason is my photos don't do justice to guns such as this. 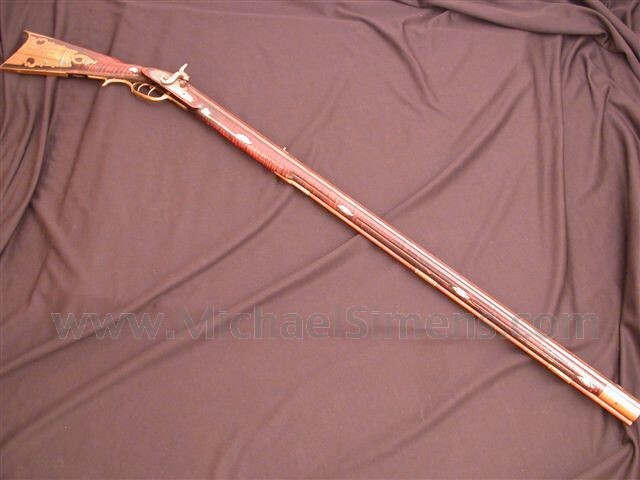 This is a simply outstanding Pennsylvania Long Rifle. 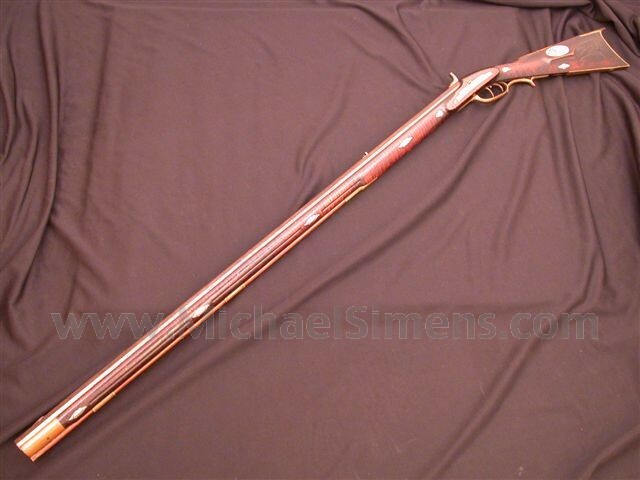 It is in 44 caliber with a heavy 40&1/4" barrel. I can't describe what wonderful condition this gun is in, save to say that it is almost blemish-free. 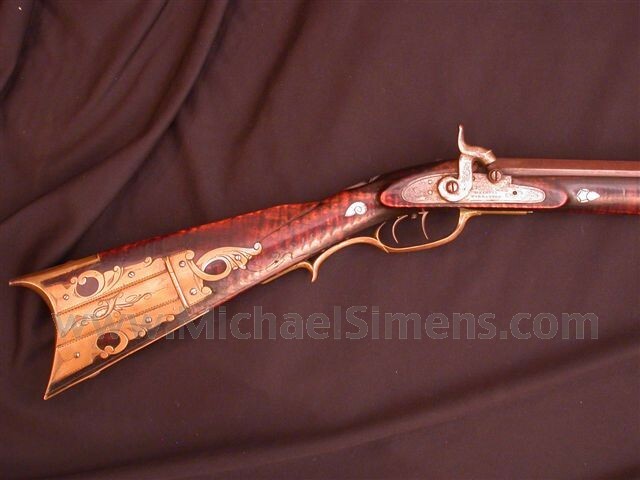 It shows an almost complete lack of small nicks, dings or scratches that show on even the finest condition guns. The wood is near flawless without a single crack. The barrel, with bold "J.H. Johnson" signature in script, retains about 30% original browning scattered its entire length. The brass mounts to include the patchbox are a fantastic nut-brown patina. It has 15 silver inlays about the gun that include 8 key escuchions and they are engraved so finely that they appear nearly "raised-carved", just fantastic work. In addition, the barrel is attached to the stock with a blind-pin system in that the pins do not come through the silver inlays on either side of the stock. It's simply exquisite work. The cheek-piece shows a fierce American Eagle clutching a shield and last but not least, a beautifull "streaking comet" motif is carved behind its cheek-piece. Now, we all know that this original percussion gun is not "Golden-Age", and we can debate that a good gun by this maker usually sells for less than I am asking. The fact remains that I have shown this gun to my little band of Kentucky lovers and they have seldom encountered such a gun at any shows or collections in the past and agree that this is the finest of its type they have ever seen. They told me I should just take it to a good rifle show and an educated buyer would scarf it up in the first hour. 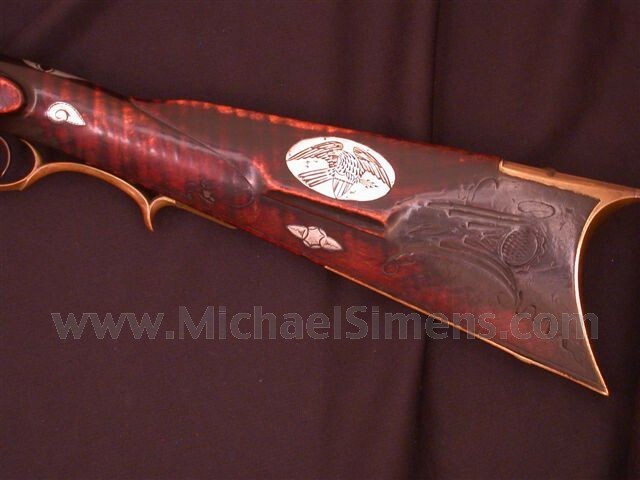 If you like great Percussion Rifles or are contemplating buying your first, give me a call on this gun. It is one of the few that I would bother to take extra photos of to display how truly beautiful it is. It was formerly in the collection of Gerald C. Stowe, former curator West Point Museum in the 1950's. He obviously recognized a great gun when he saw one.